Spider-Man, not Spiderman, is among the most popular of all comic superheroes, and has been since his introduction way back in 1962. We narrowed our favorite Spider-Man memes to fifteen because Spider-Man first appeared in Amazing Fantasy, issue #15. What Do Spider-Man Memes Mean? Spider-Man fights New York's most notorious super-villains. But take off the mask and he's still the young Peter Parker, struggling to find love, pay the rent, and satisfy the unrealistic demands of his boss. Spider-Man memes explore this juxtaposition of hidden powers and common problems. Spider-Man is an accidental superhero. He isn't always certain what's the best action to take. He often fails, but he never quits. Spider-Man memes reflect these competing traits. Many also acknowledge the fact that spider powers are a bit creepy. Spider-Man is popular and that's why there are so many Spider-Man memes. Let's get this out of the way. 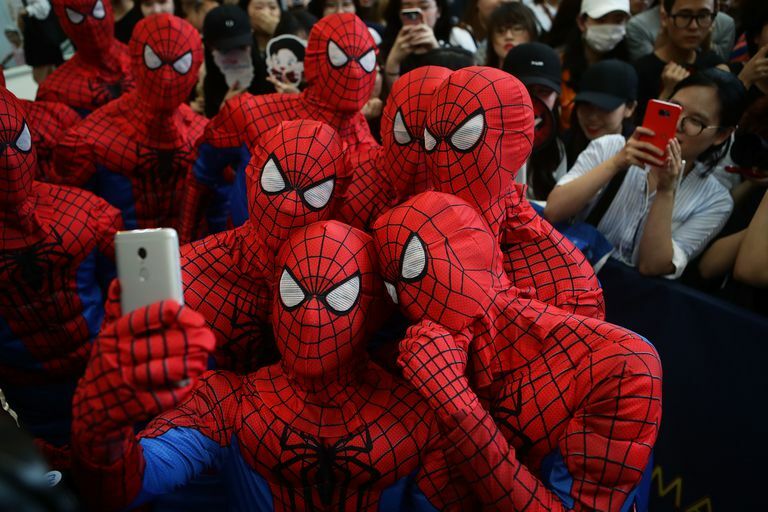 Kids today may applaud Spider-Man's appearance in the latest Marvel blockbuster, but he was created back when Baby Boomers were themselves younglings. Those early low-budget cartoons were decidedly trippy. Spider-Man memes embrace this old school wackiness. Spider-Man is actually just a boy. We carry supercomputers in our pockets and can connect with the world, so how come we often feel so powerless? Spider-Man memes help ease our pain. Even our favorite superhero gets grounded. Life is hard for Spider-Man and for everyman. A core theme of Spider-Man is that he's an everyman. He has a hard time getting a date, paying his bills, meeting a deadline – oh, and saving hundreds of lives on a subway careening out of control. Spider-Man memes know exactly what that feels like. Spider-Man only looks like Deadpool. The web loves to juxtapose the raunchy humor from Deadpool with the casual heroics of Spider-Man. The two masked heroes look alike, but certainly don't act alike. There's a slew of similar Deadpool meets Spider-Man memes out there, most less discreet than our favorite. He's a man. He's a spider. He's a...Gryffindor? Netizens love mashing up their favorite superhero with their favorite wizard, Harry Potter. Both lost their parents at a young age and both had tragic missteps while learning to harness their powers. Spider-Man meets Harry Potter was bound to be turned into a meme. Being a spider-man is weird. He comes out at night, sneaks around, leaps about, spins a web, all like a spider. Superpowers are great, but the life of a superhero can get weird. Ever notice? The Internet has. A spider-man may seem weird to some, but the villains who populate Spider-Man's world are especially weird. Count on the Internet to make it weirder. When you think Iron Man, you think Robert Downey, Jr. Captain America is always played by Chris Evans. But, Spider-Man? The Spider-Man movies have featured Tobey Maguire, Andrew Garfield, and Tom Holland. He's played by still another actor on Broadway. This doesn't even take into account the different incarnations of Spider-Man in comic book form. (No, it's not always Peter Parker.) Spider-Man memes happily play with this merry-go-round of spider-men. Spider-Man is a superhero but always in need of some quick cash. Take off the mask and Spider-Man is more struggling artist than conquering superhero. He's always broke and life in the big city isn't cheap. Spider-Man memes have the solution: call J.G. Wentworth. Now! Even Spider-Man villains like Green Goblin sometimes have to behave. Just like Peter Parker when he takes off the Spider-Man mask, many Spider-Man villains also have day jobs. Spider-Man memes understand. Everyone's got a boss. It took Marvel so long to secure the film rights to its own creation that two Spider-Man actors outgrew the role. Then after years of fan anticipation, Spider-Man finally appears in a big budget Marvel film –about Captain America. Spider-Man memes are not amused. Spider-Man is more man than spider. Peter Parker was bit by a radioactive spider. This endowed him with numerous spidey powers. But what else? The Internet is curious. Everywhere Peter Parker turns, there's a reminder that his beloved Uncle Ben is dead. Also, Toby Maguire cries a lot in the Spider-Man movies. Spider-Man memes smell opportunity. News editor J. Jonah Jameson, Jr. doesn't care much for Peter Parker and he positively can't stand Spider-Man. Also, he looks like...Hitler? Maybe Spider-Man creator Stan Lee never cared much for his real-life boss? Spider-Man memes sure don't. Spider-Man needs a father figure. Peter Parker craves a father figure. Tony Stark, aka Iron Man, is there to help. The Internet is there to make fun of all this, particularly after Tom Holland, the current Spider-Man, dressed as a woman for the popular TV show, Lip Sync Battle. Poor, Tom. The Internet never forgets.